Kathy Ozer served as Executive Director of National Family Farm Coalition from the early 1990s though her death in January 2017. For most of those years, NFFC was practically synonymous with Kathy — her encyclopedic knowledge of farm policy; her vast contact network of farmers, legislators, Hill staff, and advocates; and her great kindness and generosity. Prior to joining NFFC in the depths of the 1980s farm crisis, Kathy worked for the US Student Association on education access. She translated her understanding of student credit into farm credit, and became one of the key authors of the groundbreaking 1987 Agricultural Credit Act, which saved thousands of farms from foreclosure. For nearly thirty years, Kathy worked on farm, rural, and fair trade policy for NFFC, partnering with colleagues around the US and abroad, and always championing the voices and concerns of farmers. She addressed credit and global food crises, fairness and competition in farm and food policy, and the ongoing dairy crisis. She was a systems thinker, always understanding how the struggles of all people are intertwined. She explicitly worked with Black, Latino, Hmong, and other farmers of color; forged relationships with farm and food worker organizations; and broadened National Family Farm Coalition to include fishery groups. 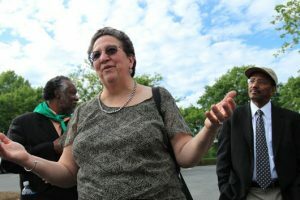 Kathy represented NFFC on the boards of the Citizens Trade Campaign and Jobs with Justice, and was a cofounding member of the US Food Sovereignty Alliance. She was part of farmer delegations at the United Nations and at World Trade Organization meetings in Seattle and Cancun. Born August 4, 1958, Kathy died on January 22, 2017, after two years of battling non-Hodgkin’s lymphoma. She was 58. Kathy received her B.A. in Economics from the University of Massachusetts/Amherst and lived with her husband David Battey in the Adams-Morgan neighborhood of Washington, DC. She is survived by her husband; her parents, siblings, nieces and nephews; and countless friends and colleagues within and beyond the family farm movement. Kathy is greatly missed. Her spirit guides NFFC as we continue the work she was so proud of, representing the family farmers and fishers she nurtured and fought for through the years. Here we gather some of the tributes by friends and colleagues on her passing.